The US Dept of Agriculture reported that many Tobacco Growers are making a major crop change! Ditching the harmful effects of farming tobacco to a more sustainable and healthy choice. Farming Tobacco is a nasty business, and even handling the tobacco plant has is unhealthy effects. This new crop: Stevia. This choice is refreshing due to its benefits for both the consumer and the farmer. Stevia has been used for centuries in Asia as a natural herbal sweetener that’s perfect for sweetening beverages and foods. You can find Stevia in health stores and natural markets in a pure green leaf form, which is not processed like the white powder versions you can find on the mainstream grocery store shelf. Currently the most recognized consumer brand is Truvia and is made by CocaCola. Its also the second best selling sugar substitute. 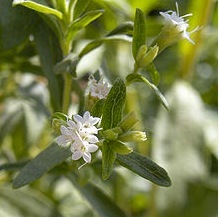 The World Health Organization (WHO) estimates stevia intake could eventually replace 20-30% of all dietary sweeteners. The total global sweetener market was estimated at $58.3 billion in 2010. Its exciting to see this new alternative crop becoming a growing agiriindustry and replacing the toxic tobacco crops. Stevia First stock may be a good one to keep an eye on. For smokers who are quitting Stevia is an excellent sweetener choice to keep from adding a few extra pounds from eating sweets when cravings kick in. This entry was posted in Environmental News and tagged agribusiness, stevia benefits, tobacco crops, us department of agriculture on October 21, 2013 by sanbreck.